Heat the oven to 400°F. Spoon 1/4 teaspoon ketchup into each pastry cup. 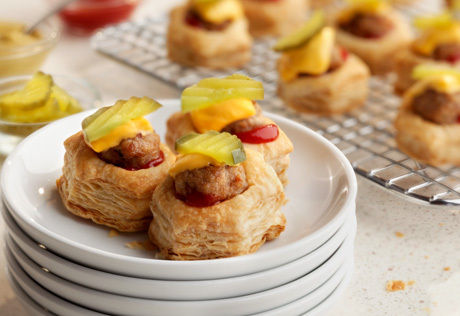 Place 1 mini meatball into each pastry cup. Top each with 1 quarter slice cheese. Bake for 2 minutes or until the cheese is melted. Top with the pickle slices. Flavor Variation: You can substitute sriracha ranch for the ketchup. Mix 2 tablespoons ranch dressing and 1 teaspoon sriracha sauce.